After my post on Five Spice Banana Cream, I received many emails asking for more satisfying and nourishing desserts, that are quick and easy to make. I love making sorbet with frozen fruit; it is so tasty and easy. The weather has started to been getting warm up here in the Bay Area, which reminded me how nice it is to have a frozen treat on a hot day. 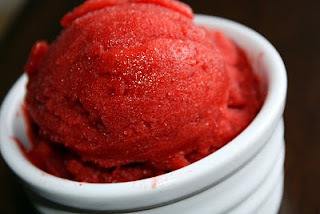 Sorbet can be made with a variety of flavor combinations, but my all time favorite is Strawberry Balsamic Sorbet. You already know that I love Strawberry Balsamic Jam and here is a great way to save those summer strawberries that don’t make it into jam—freeze them! Best of all about this recipe, it is only three ingredients! Make sure to use good quality, pure Balsamic vinegar (read the label! ), as most commercial Balsamic is made with red wine vinegar or concentrated grape juice mixed with strong vinegar, and then laced with caramel and sugar–not what nature intended! Balsamic vinegar has anti-bacterial and anti-viral properties and contains the powerful antioxidant polyphenols. Polyphenols fights free radicals, boosts the immune system and protects the body against heart disease. Balsamic vinegar also contains a metabolism-boosting enzyme called pepsin and is chock full of minerals. 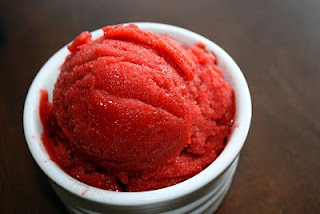 Taste-wise, it really boosts the fabulous strawberry flavor making this an incredibly satisfying sorbet. I use maple syrup in this sorbet as a sweetener, due to its numerous health benefits and its ability to blend smoothly. I haven't yet to try the strawberry-balsamic combination but that sounds really good. I just bought a whole bunch of strawberries, so this is perfect! Woah, I guess you could try this with most frozen fruit. I can't believe it is that easy. Why buy sorbet in the store? I am excited to come up with different combinations–maybe something with mango? I love your simple yet spectacular desserts! Strawberries, balsamic vinegar and a natural sweetener are a combination that I've learned to love (I've had fresh strawberries with honey and ground black pepper). Delicious! That sorbet has such an appealing color, it screams summer and fun! I am glad you made it and reminded me that I need to do more of these! So it is getting warmer in the Bay area? I used to go to San Fransisco a lot and I love the area, it is heaven to me. Nearly. this looks so good – I basically am up for anything cold and icy now that spring is here. i have to check out my balsamic vinegar ingredients..I think I buy a pretty good one but I have to check now! thanks for bringing that to my attention! I would love to make this gorgeous sorbet! This looks so delicious! We're just starting to get strawberries at the farmer's market, so I'll have to give it a try. I've never made strawberry sorbet with balsamic vinegar before! I love this recipe as it doesn't contain any white sugar and combines two of my favorite flavors! I am printing this one out! The strawberry balsamic combo is spectacular and I'm totally into making sorbets these days so I will go make this asap! This is really refreshing for the summer here. The color is vibrant and so alive. Simple and superb. Also great with a sprinkling of black pepper. Tomorrow, I'm actually posting a strawberry sorbet recipe!!!!!!! Oh man, this is truly seducing! Balsamic sounds good too! wow! I'm drooling -that looks amazing! What an interesting–and unusual–combination of ingredients. I'm with Simply Life, though, and drooling to beat the band! Strawberries are my absolute favorite thing in the universe! And I totally took a look at my balsamic vinegar label after I read this 🙂 Mine is the bad kind…time to go shopping!